Rated to 1,050°C, the HSK Series rapid firing furnace features an ultra-clean low-mass refractory heating chamber. 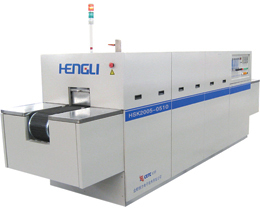 The HSK model heats from ambient to 1,050 °C in approximately 40 minutes, and is designed to sustain continuous on/off heating and cooling cycles resulting from alternating periods of production and non-use. 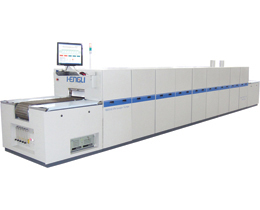 Atmosphere distribution and management system eliminate thermal shock and process contamination. 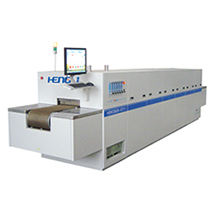 HSK series belt furnaces serve diverse industries such as microelectronics packaging, which includes IC, SMT, HIC, MCM and MEMS applications, and advanced materials, including thick film, electronic component, photovoltaic cells, ceramics and metals processing applications. Belt Width 250mm/10" 350mm/14" 635mm/25"
Tunnel Height 50mm/2" 50mm/2" 50mm/2"
Heating Length 2700mm/106" 3150mm/124" 3220mm/127"
Cooling Length 1200mm/47" 1300mm/51" 1200mm/47"
Overall System Width 1200mm/47" 1350mm/53" 1500mm/59"
Overall System Length 6905mm/272" 6905mm/272" 6905mm/272"
Overall System Height 1350mm/53" 1350mm/53" 1350mm/53"
Our dedicated engineers will always take the extra step to work with clients for customized designs.